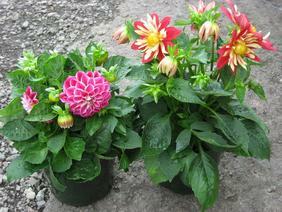 Description: Dahlias and dahliettas are tuberous plants that produce brightly colored, showy, double/ball flowers. The dahlias have longer stems for cuts, while the dahliettas make a nice table centerpiece. Both will add a lot of color to the landscape. Dead head for a longer flowering period.